Bharti Airtel has updated its website and listed the plan we are talking about. In Airtel 293 Plan (FRC), Airtel is offering 1GB data/day for 180 days for Data Card owner and in Airtel 449 Plan (FRC) as well, Airtel is offering 1GB data/day for 180 days. We tried contacting the customer care and even visited the Airtel representative store but the individuals there are also not aware of these plans till now. Also since both the plans offer similar benefits, we are expecting Bharti Airtel to tweak either of them to make some sense. The Airtel 293 Plan for Airtel Datacard Dongle and Airtel 449 Plan for Datacard Dongle are listed for all telecom circles and no single telecom has been left out. Only important point about these plans is that they are available for new Datacard Dongle users only and not for existing Airtel Dongle users. Just to remind you, Airtel already has launched 1GB data per day, 2 GB data per day & 3 GB data per day plans for Data Dongle users at Rs. 499, Rs. 699 & Rs. 999 respectively. We first reported this in early June and almost 2 months have passed. You can read more here. Then Airtel revised its Special Tariff Vouchers (Plans) for existing users offering up to 5 GB data per day starting at Rs. 499 only. You can find a suitable Plan with your data needs at this page. Also Reliance Jio introduced a new JioFi Offer wherein new customers buying a JioFi Dongle for Rs. 1999 can avail Unlimited Calls & Data benefits for similar amount. We did a comprehensive story on this where we explained whether to go for it or not, you can read it here. 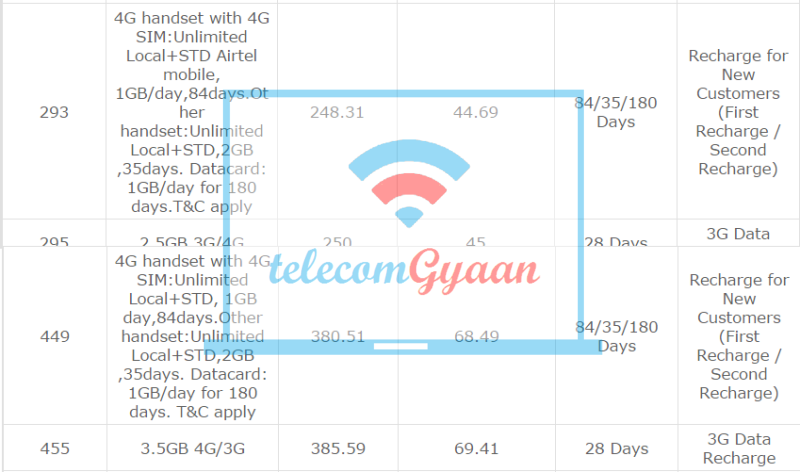 Keep tuned to telecomGyaan.com to know any further development on this and even for new & exclusive updates.